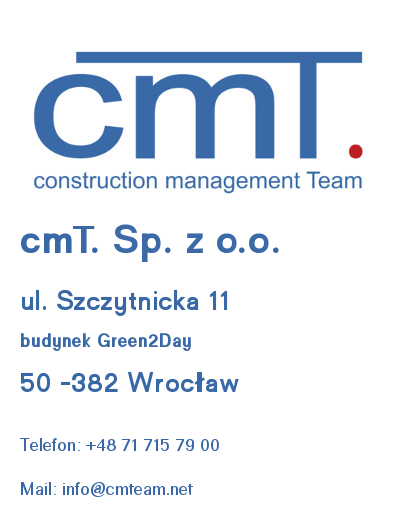 cmT with the headquarter in Warsaw and dynamically operating branches in Germany and Spain has been successfully supporting clients in the area of construction process management services on an international scale for 15 years. Another milestone in the company's development is the opening of a new in Lower Silesia in February 2019 as a a new point on the city map. The Wrocław branch is located just by the Odra river in the modern Green2Day office building at Szczytnicka 11 street in close proximity to the University of Wroclaw.The interior of the office was designed by a team of architects from our sister company GerPlan. We want to be close to the market, to know its local specification, to provide clients with expertise and support with use of the the best specialists with full insight into local connections and market conditions. It promises to be a very intense period for our Wrocław team!